We have uploaded a video walkthrough of What happened to Michael, our entry to Ludum Dare 37, to Youtube! This is my 2nd Ludum Dare and I’m more satisfied with this entry compared to the last one. Forgive me if the art is horrible, but I tried my best. If the game gets 100 votes before the final judgment, I promise to program and put a fourth puzzle in the game! PLAY AND RATE AT THIS POINT AND CLICK SHAPESHIFT FOR CHEESE HERE ! This is my first LD and also my first game project after a really long time. I started it late so I wasn’t hoping to be able to finish for the jam, but this is a bit of what I’ve got so far. I ve made a mistery/puzzle short game in which the player has to figure out what to do by deciphering the clues in the environment while it all keeps changing shape. Depending on the paths the player takes, different shape shifting events will happen on the environment. I chose to mix both pixel art and hand drawn paper with child like art style. All design and artistic elements are related to the plot the player shall reveal by finding the ways through the shape shifting maze. It’s being a really fruitful experience. ‘Plan M’ – Enhanced Edition! The eagle-eyed amongst you might have noticed that the Enhanced Edition of Plan M went up earlier today. It adds a laundry-list of brilliant stuff, and you probably owe it to yourself to play it. Not that I’m biased or anything. A complete soundtrack, which will get stuck in your head for days. Sound FX for loads of important actions and events, and also for several completely useless ones. A menu (wow!) which allows you to load a previous save without having to watch the entire intro again. Two (count ’em!) completely new scenes, which further develop the characters of Dr. M and Señor Banana (it makes sense if you’ve played it). Many new interactions and animations, to make the world seem more alive. A re-written ending, to properly end the story. Literally tens of bug fixes and tweaks to make the game more fun, based on your feedback. There may even be more features which I have forgotten about. That’s right – I can’t even keep track of how awesome it is compared to the original release. No voice pack as yet, I’m afraid. If the demand is there, I’m sure a few days can be set aside for the recording of one. New update for the point’n’click game. I have the whole story in my head but I don’t want to disclose anything yet, just in case I change my mind, or even for a simple surprise factor. I’ve finished setting up the base engine, working inventory, picking up items and all that stuff. Entities in the game communicate by throwing messages to each other using Lua (and Angel-Engine), so after I complete the base engine and all the content (images) it should be really easy to rig together based on a simple cause->consequence reaction. After all of this is done, I would call the game complete. So far I’m mostly worried about point 1 and 2, but again, it shouldn’t be too hard to set up. I’m using recursive structures for data definition in Lua. Pretty neat stuff. 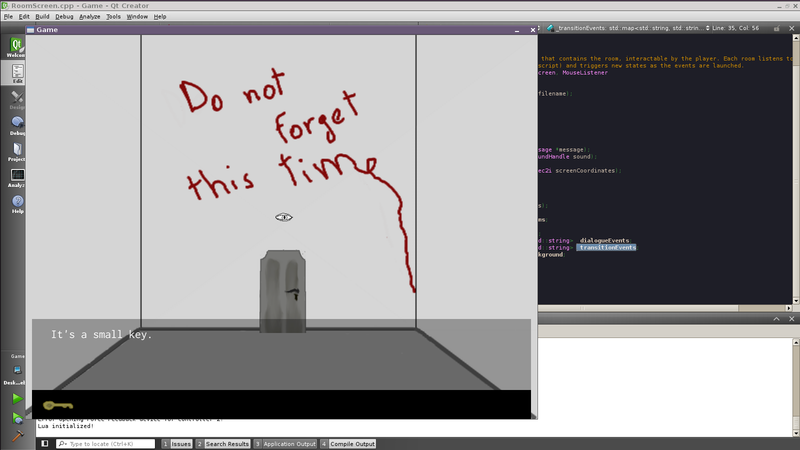 Here’s a screenshot of the “first” room in the game, a simple “unlock the door with the key” challenge. Art is temporary, depending on the time left after I finish the game I may come back and polish it a lot more (I hope so). 19 queries executed in 0.085 seconds.